Beth, Sarah and Marie have been friends forever. Now they are grown up, with busy lives, busy husbands, busy kids… but they still find time to meet up over dinner once a month. A cosy, comfortable gathering of happy couples - or so they thought. Review: I am such a huge fan of Tracy Bloom's writing. What I think I love so much about it is that she has the ability to make me laugh whilst still delving into some deep topics and making me think. Her characters are well-formed and well rounded and could be me and my friends but they get themselves into some hilarious situations and they get themselves into some unbelievable situations whilst at the same time just going through life's up as downs! This book was no exception, it made me laugh but actually there were some really serious and life-changing moments in this novel. I loved the premise behind the six friends and their dinner parties and what would happen if an outsider joined them and shook the whole thing up? This book reminded me of The Sunday Lunch Club by Juliet Ashton because of all the dinners and also a lot of Liane Moriarty's work because of the structure and to some extent a little of the style. Things unfold slowly and we don't get the full story until the end. The characters are all pretty normal people, all of them intriguing, not all of them liable. I'd say its quite a large cast of characters although Beth seems to be the driving force behind the bock. I found Beth easy to like, despite the fact that she has flaws. Marie and Sarah, the other women in the book took me a little while to warm to and I wouldn't necessarily say I liked them but I did want to know what was going on in their heads and I could sympathise with the lives they had found themselves in. I wouldn't say I really took a shine to any of the men in the book, they seemed to slow the women down to a certain extent although I liked the friendship that Chris and Simon had formed and I felt I had an affinity with Chris because of his love of dips. When he comes back from the shop with one of those four packs of dips, I did a little clap, I have to admit! Overall I got to know the characters and the structure of the book is very compelling so I did find myself turning and turning the pages. 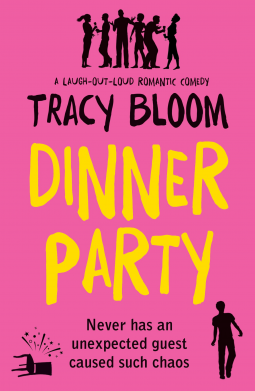 I laughed and I gasped and I clapped so overall to me, this is another great read from Tracy Bloom!